They escaped their pasts, for the adventure of a lifetime . . .
After a horrendous ordeal, Molly applies for a job as a Butlin’s Aunty. When she receives news that she has got the job, she immediately leaves her small home town – in search of a new life in Skegness. Molly finds true friendship in Freda, Bunty and Plum. But the biggest shock is discovering that star of the silver screen, Johnny Johnson, is working at Butlin’s as head of the entertainment team. Johnny takes an instant liking to Molly and she begins to shed the shackles of her recent traumas. Will Johnny be just the distraction Molly needs – or is he too good be to be true? I’m so pleased to welcome you to my stop on the blog tour for The Butlins Girls. I had no prior knowledge of holiday camps before reading this book so I had no idea exactly what to expect, but I’m so glad that I read this, it was such a delightful read. You know those books that just leave you feeling happy and warm when you’re done? This is that type of book, it was adorable. After discovering that Butlins holiday camps are indeed real, (excuse me, my American is showing) I spent some time doing good old Google research as I was reading because I was so taken with the concept. The first camp opened in 1936 and though they closed during the war, they are still running today! I had a blast looking through their website and am now trying to figure out how to convince my husband we need to take a vacation there. 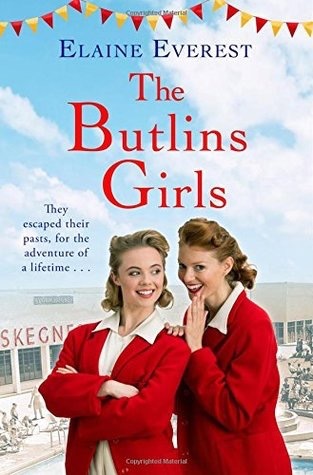 The book is set when Butlins opens after the war is over and Molly Missons gets a job there. The characterization is fantastic, Molly is such a dear, sweet, innocent girl, I took to her right away. Her parents passed away in a car accident and she has no family left. She does, however have some wonderful friends and that’s who she turns too when times are hard. When her friend, Freda encourages her to apply for a job at Butlins she takes a chance and meets some lifelong friends in her roommates Bunty and Plum, both of whom are also well drawn, though all three are vastly different. She also meets Johnny, a movie star who is in the entertainment part of the camp. This had a little something for everyone, it has a deep history, some light romance, and even some mystery, a cozy one at that. It was about friendship and family and had a saga feel to it with some drama added. Freda is apparently from Everest’s first novel, The Woolworths Girls and now I’m eager to go back and read more about her. I’m also holding out hope that maybe there will be a sequel to this book, it was such a truly lovely, warm read. Even though I’m from Canada, I have heard about Butlins, probably from my Britsh hubby. This sounds like a fun read. Great review! Best of luck with this book Elaine. I just book the book from Kobo and look forward to reading it! Great post, I’d love to hear your experiences and thoughts. I’m considering blog tour and I’d like to ensure I’m one of those nice, considerate authors that is a joy to work with.